Exactly what are antique marks and china marks. What can they tell you? Watching the experts at antique roadshows or on auction house valuation days, you probably wonder just how they get so much information about a teacup, vase or a piece of silver simply by turning the item upside down. The fact is the markings that are stamped, painted or impressed on the underside of most antique items can help you tell a great deal about a piece other than just who made it. What the antiques expert is looking for is some historical reference point. 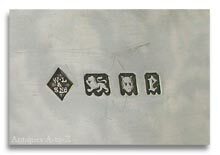 A makers mark that they have learned over many years spent researching and studying antique marks. What few people are aware of is that it’s not just the name of the company such as moorcroft, rookwood, worcester or doulton that may be there, but also a number of other things used by the manufacturer, designer or artists and placed in or around the mark itself. Dating Antiques … How do we date antiques using antique marks & china marks? Dating an antique is a little like detective work. The company name itself only gives the appraiser a rough timeline of when the company was known to operate. 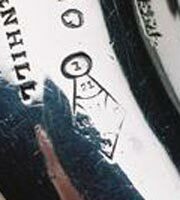 Other factors such as the colour of the mark, how it’s applied or the numbered codes within the design can often date a piece to the exact year it was produced and tell you where or who the specific artist was. Silver hallmarks, pewter touch marks, signatures on bronzes, foundry marks and engraved signatures on glass can all help to point you in the right direction. However, few collectors, buyers or sellers have the ability to memorise all china marka, signatures or number codes used on antiques. Even the experts that deal in antiques for a living, still need good sources of information to refer too. In 1891 the Mckinley Tariff Act of America required all imports to America to bear the name of the country of origin. So, an item bearing the words – England – or another country, will have been produced on or after 1891. Similarly – Made In England – will date a piece to after 1921. Printed or Stamped marks in colours other than blue tend to be post 1850. The use of the word Royal before a company name tends to be used after 1850. The word Limited or Ltd appears after 1860 when a law was passed requiring it to be shown by limited liability companies. Although it was being used on some pieces from 1885 onwards. In 1862, the Trade Mark Act became law. Therefore any piece bearing the words – Trade Mark – can be taken as being made after that year. Items bearing a pattern number or pattern name, can be assumed to date no earlier than 1810. 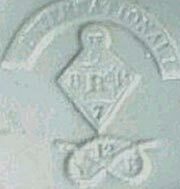 Royal Arms incorporated into a small mark indicates a date after 1800. From the 19th Century onward ‘Royal Arms’ were often granted by the Monarch and added to the manufacturers name or trade name. Pieces bearing "Royal" can usually be dated after 1850. The above rules are guides rather than hard and fast rules, as there are some exceptions depending on individual company practices and further research should always be carried out before parting with your money. 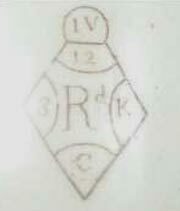 Illustrated below are the two forms of Design Registration Mark or Kite Mark used between the years – 1842 to 1883. 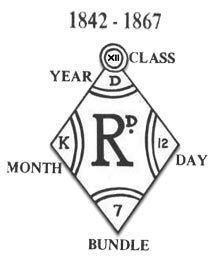 The left hand image demonstrates a design registration mark for 12th November 1852 (K for November and D for 1852). 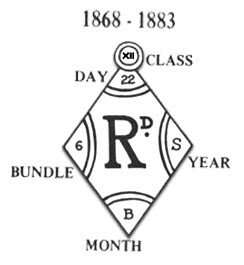 The right hand image demonstrates a design registration mark for 22nd October 1875 (B for October and S for 1875). Remember – The dates only refer to the date the design was first registered and should only be used to give you an indication of the earliest possible date a piece may have been manufactured. For the purposes of dating antiques, the bundle code does not matter. 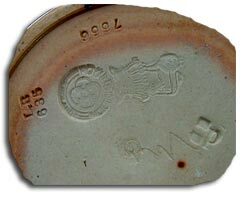 The marks were often stamped irregularly into ceramics or metalware and printed on top of the glaze. Most marks have either not taken properly or have worn over time and are difficult to read. This is probably why the Victorian kite mark was changed to a Registration serial number in 1884. The examples below demonstrate just how difficult it can be to determine the actual characters in each corner. On the 1st January 1884, the whole Victorian registration kitemark system changed.